Well, they are back for more. I feel honored, I really do. The KMFRC has ordered a few more t-shirts for their family reps (the green ones below). 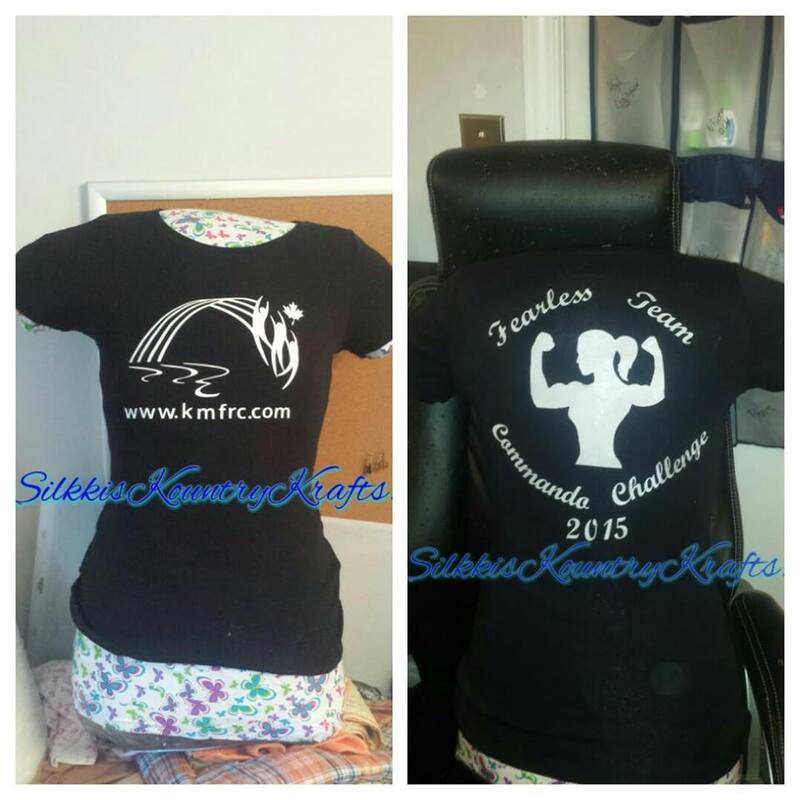 I have had the extreme pleasure to make them a few t-shirts in the past. There were the ones for the Commando Challenge (Above picture) for the spouses to feel what their husband's go through from time to time and of course the last order of lime green network shirts. Now they are needing some more. There could be a couple of different reasons for this need, they could have gotten some new reps or some may have been posted since it is posting season. I know that for at least one they were posted out. She's a friend of mine and I really enjoyed having her to talk to. I don't get attached to too many people, but this lady was an instant friend. Our stories are similar and yet so different. I just adore her. Very sad to see her go, but she has a shirt to remember me by :) and I'm sure that we will be posted to the same place again one day. God will definitely bring us together again, just hopefully not at her current location because I don't want to go there. hehe. One reason I love working for the KMFRC is pretty simple. They helped my children! When my husband was deployed last year we discovered "Deployment Socials" WHAT?! As if that's a thing. But it is. Children with moms and dads who are away and husbands and wives who have been patiently waiting for the current call of duty to be over so their loved ones are home all get together in one place and mix 'n' mingle, tell stories, share happy times, sad times, any times. And the best part... it happens in different rooms, that's right someone watches your children for you (even when you have four) and you get to talk to grown ups. This was a big deal for me. I love that the children got to socialize with other children going through separation and that I got to talk to big people who used big words, it was a big deal!! That is where I met a couple ladies that I have become pretty good friends with and reconnected with a blast from the past :) It really made my 6 months as a "single parent" fly bye. That's a term I really don't like by the way. If my husband's away and you call me a single parent don't be shocked with my lack of shyness in telling you what a messed up thing that is to call someone. Yes, I may be raising my children on my own temporarily but I am not SINGLE. Alone: Yes, Single: No! Anyway, back to the KMFRC, I'm so thankful to the one who told me about the programs there. Until last year it was just a splash pad to us. It is amazing to feel like you actually belong, like all of the emotions that you experience are similar to someone else's and although it doesn't take away the feeling that you're going crazy some days it certainly does help you not feel alone in your crazy moments, it's nice to know there are other crazies just like you out there. How can that not be a fun evening?! Oh and did I mention WE CRAFT!!! That's right, you say child free craft night and I am there. All over that!! We have yet to be back, although I totally plan on it one day. For more information head to their website, here is a little information from there: The Kingston Military Family Resource Centre (KMFRC) is a registered non-profit, charitable organization that supports and enhances the health and well-being of the military community. The KMFRC is Kingston's primary agency dedicated to meeting the unique needs of the military community. Programs and services are designed to promote community development and to provide social, educational and volunteer opportunities, empowering the military community and enhancing their health and well-being. Also, one last note from me. If you're in the Military and have a spouse, if you are said Military spouse, or know someone who is, contact your local MFRC and find out what programs that they have available for you. Do they have Deployment Socials? Do they have one day a month daycare so you can go get groceries, take a show or just go pee by yourself? I'm sure there are programs available for families that they didn't know existed. It's important for your mental health to reach out and be social and who better to do that with then someone who understands what you're going through? Call or go on line today and find out what you can. You'll be happy you did. 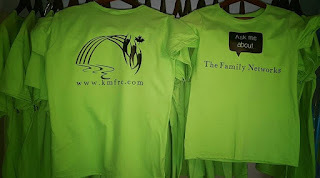 As for me, I have to get back to making some lime green shirts. Have a great night everyone.